Do you work with young people who want to increase their participation at home, school or work? Maybe you are a parent trying to help guide your young adult while transitioning into adulthood. It is important that these young people set participation goals and advocate for themselves if possible. 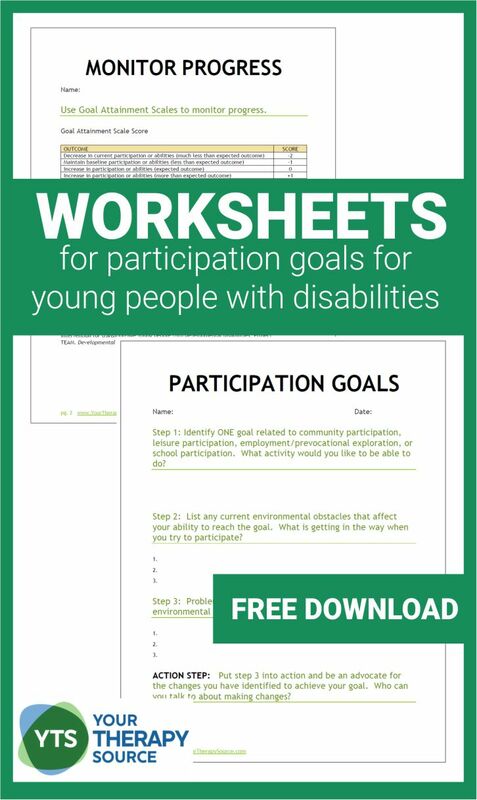 You can get started with these participation goals and worksheets for young people with disabilities at the end of this post. Individualized goal‐setting appears to support attainment of participation goals. Project TEAM appears to support young people with developmental disabilities to apply an environmental problem‐solving approach to participation barriers. Parents of young people with developmental disabilities report sustained changes in self‐determination 6 weeks after Project TEAM. Young people can work on four different areas to reach their participation goals. Step 1: Identify ONE goal related to community participation, leisure participation, employment/prevocational exploration, or school participation. What activity would you like to be able to do? Step 2: List any current environmental obstacles that affect your ability to reach the goal. What is getting in the way when you try to participate? Step 3: Problem solve and list how you can overcome the environmental obstacles or barriers to reach the goal. ACTION STEP: Put step 3 into action and be an advocate for the changes you have identified to achieve your goal. Who can you talk to about making changes? 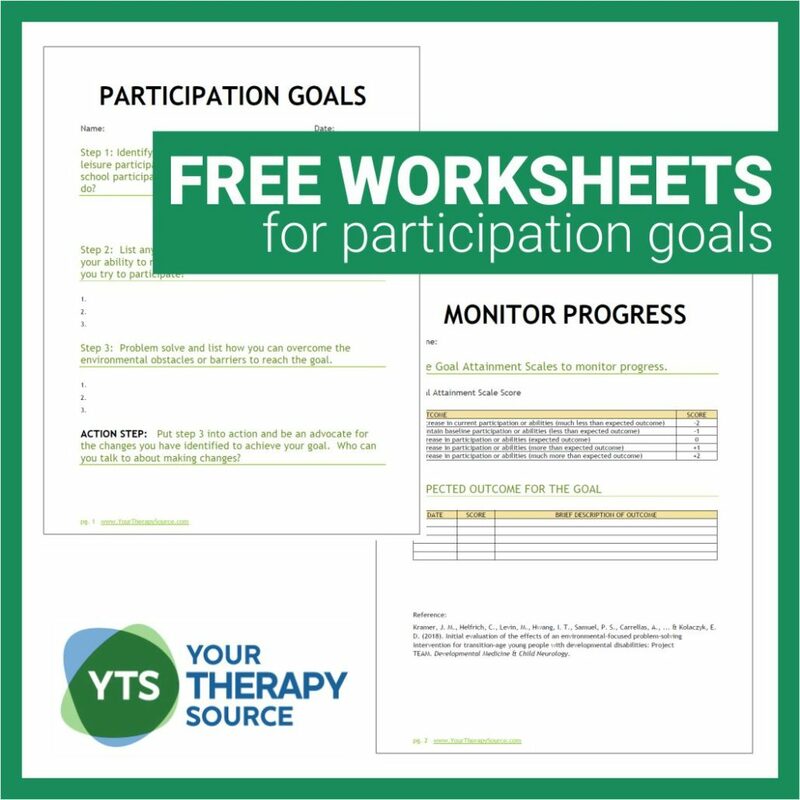 Use Goal Attainment Scales to help monitor progress toward the overall participation goal. Young people, teachers or parents can score the outcome based on whether it was much less than the expected outcome all the way to much more than the expected outcome. Sign up to receive the Your Therapy Source email weekly newsletter and other announcements. You will be redirected to the goal worksheets. Help young people to self-advocate and participate in more activities. Read more on goal expectations here. 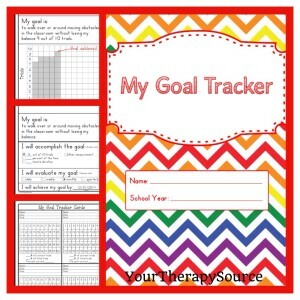 My Goal Tracker: This is an electronic book of data collection forms for students to track their own progress. The student can track his/her goals over time, by monitoring the skills over the course of a day, week, month or quarter. This allows the student to get a visual picture of improvement, decline or maintenance of different skills. Find out more. Kramer, J. M., Helfrich, C., Levin, M., Hwang, I. T., Samuel, P. S., Carrellas, A., … & Kolaczyk, E. D. (2018). Initial evaluation of the effects of an environmental‐focused problem‐solving intervention for transition‐age young people with developmental disabilities: Project TEAM. Developmental Medicine & Child Neurology.